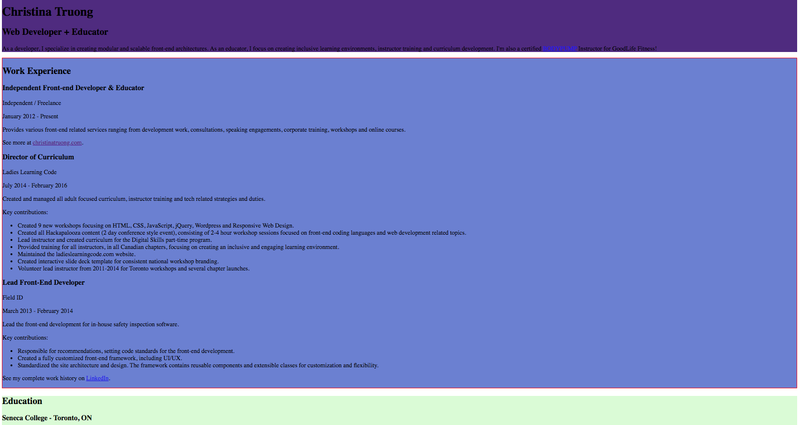 I’m really trying to nail down my understanding of exactly how css displays elements and the space they take up. I have found learning to turn borders on very very helpful to see the exact space boxes take up, but what this doesn’t tell me is the margin of particular elements. Is there a way to display a box not only around the box itself but the margins contained within the element? 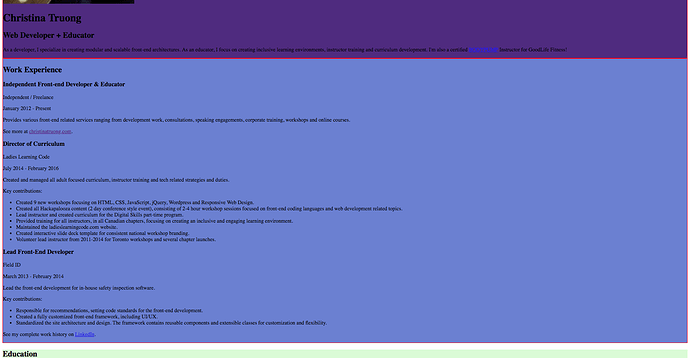 When I add borders to either the footer/header or to the education section, it seems to join the two sections together with the borders and I’m having a hard time trying to understand why this happens (see example below with border turned on for header/footer). Does anyone know why this happens and what exactly it is doing? Does anyone know why this happens and what exactly it is doing? The CSS margins refer to space around elements not including any defined borders. I do not see where your defined margins for any of these elements/classes. Also, I do not know what html you are using for these examples. If you post all the html and css, I could better explain how the space “disappears” in the 2nd example. I haven’t defined any margins. Should I always start by doing this rather than just using the browser presets? I did just add some negative margins into the code btw to see if this would close the gap between the sections. The h2 and p elements have a default margin values, which are causing the space. See w3schools Default CSS Values for HTML Elements for more information.